Deck the halls with our Christmas Tree Quilt using a log cabin block. Joy is an easy quilt pattern using a log cabin quilt block. This wall hanging is bound to add sparkle and beauty to any room in your home during the holiday season. What's so unique with a log cabin block is you can create many different designs using the same block pattern just as we did with our Christmas Tree Quilt. This is true with several other blocks that we find in the quilting world such as the triangle blocks and others. Quilting doesn't have to be hard there are many easy quilt patterns for beginners. To prove how diverse the log cabin block is, we are using it in our Christmas project this year. 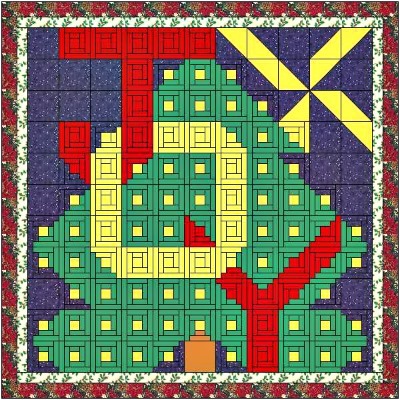 Look close and you will see that this Christmas quilt has only one log cabin block and one HST block and a plain square. Simply by changing the color arrangement you create a totally different look and feel. This is a full/queen size quilt and finishes out approximately 76 inches x 76 inches. The easy quilt pattern is simple to make and can be done while relaxing from your busy schedule. If you were to purchase a quilt pattern, this is the one to choose. You can even learn to quilt with this simple design. It is made from 91- LC blocks, 11- HST blocks and 19- plain blocks. When combined, it makes the Christmas Tree Quilt very fast to assemble. You have plenty of time to complete it in order to show it off for your holiday events or even give it as a gift for that special someone. Remember, any handmade gift is superlative to any 'made in China' brand. This Christmas Quilt pattern makes it easy for those of us who are having trouble finding just the right color choices to bring this quilt together. Having Trouble Finding the Right Fabric?